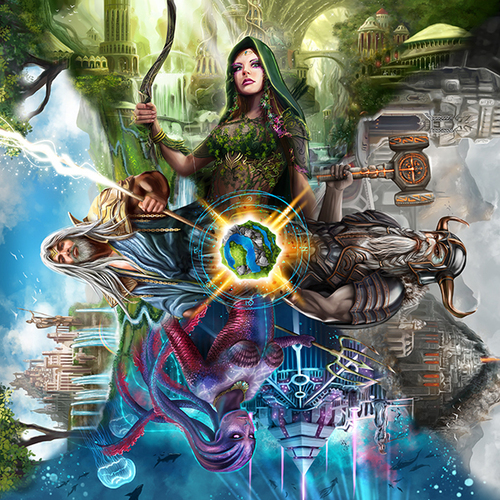 4 Gods is the newest game from Christophe Boelinger, who has a number of game designs under his belt, and is probably best known for Archipelago, Earth Reborn and Dungeon Twister – all very different from each other. This new release continues to show the diversity of Mr. Boelinger’s creativity as 4 Gods feels different than his previous releases. In this game, players act as Gods who as building a new world – filling it in from the edges. Though it doesn’t make sense thematically, they don’t know their identities at the start of the process, but as the world is being built, the players will choose which God they are – and then work to have the most and best influence over the new world. 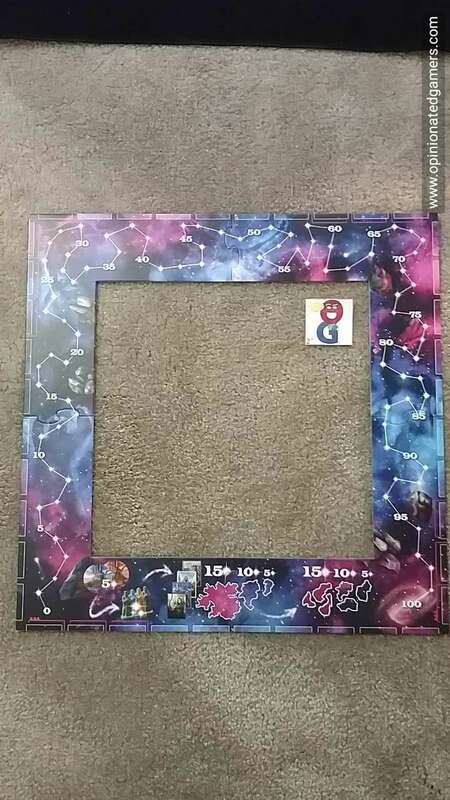 At the start of the game, the board is made – a square frame made of jigsaw pieces. All of the two-sided world tiles are mixed in a bag, and each player draws two tiles to start the game. Each player sits on a side of the board, and there are ten spaces for discarded tiles at the edge of each side of the board. All the other pieces are placed near the board where everyone car reach them. Place a tile – you start the game with two tiles, one in each hand. You can place a tile in the world so long as it touches two other edges (this can include the frame) and such that all the newly placed terrain matches all other tiles that it touches. Note that round city tiles do not count as edges. Discard a tile – you can place a tile into the row of discards in front of you. You have space for 10 tiles on your side of the board. Draw a tile from the bag – If both of your hands are free, you may take the bag and draw one or two tiles. You may not draw tiles if your discard row is full. Flip a discarded tile – you can turn over a terrain tile in anyone’s discard row to see what is on the other side. Draw a discarded tile – you can pick up a discarded tile from any edge on the board. However, once you pick it up, you must either play it OR discard it in your own discard row. Choose a God – once during the game, you can choose one of the 4 Gods to represent in this game. You take the identity tile and box of prophets for that God. Once you have chosen a God, you can then placed prophets and build cities. Placing a Prophet – assuming you have chosen an identity (and therefore have a box of prophet figures), you can now place a prophet on any terrain tile that you have just placed. It is placed on a specific terrain on that newly placed tile. You can choose any terrain shown on the tile. If your reserve is empty, you can move a previously placed prophet to your newly placed tile. 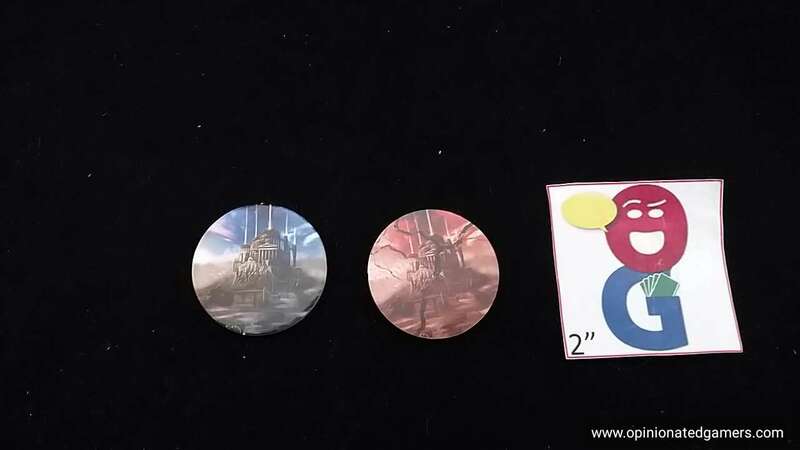 Building a Legendary City – There are 8 City tokens in the game, if you find a space which you think a valid tile cannot be built, you can place a City there – mark ownership with one of your prophet markers. The City must touch at least two straight edges from the frame or previously placed tiles. If the city survives until the end of the game, you will score points. Destroying a Legendary City – If you find a tile which can be played legally in a space where there is a City tile – though not a City which you control – you play the tile and take the round City tile off the board. You keep the city tile as a scoring marker for the endgame. Kingdoms – look at the terrain areas on the board, each contiguous area of a terrain type is considered a kingdom. The player or players who have the most prophets in a kingdom score 1VP for each tile in that kingdom which do not have a prophet standing on the same terrain. All prophets can be removed from the board once the kingdom is scored to show what has been scored already. Largest Kingdoms – there are 4 terrains in the game, and each corresponds to one of the Gods. Each player finds the largest kingdom (in terms of tiles) of their terrain type – The largest/second/third number of tiles scores 15/10/5 VP. Most Kingdoms – Now, each player counts the number of different distinct kingdoms in their terrain type. The player with the most/2nd/3rd in quantity scores 15/10/5 VP. 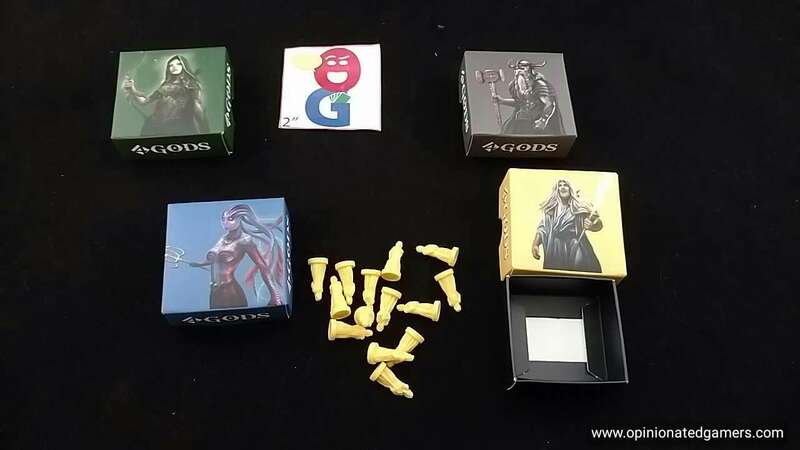 4 Gods is a frenetic game, with most of our games taking less than 20 minutes – in fact, it feels like it takes longer to explain the rules than it does to play it! As the game is played in real time, I try to make sure that everyone understands all the rules before we start because it’s really hard to stop in the middle of the game to explain things. While playing the game, you also need to keep an eye out for pieces placed in error. If an error is spotted, you have to try to figure out who placed it so that it can be remedied. Hopefully, it doesn’t happen often because it can really screw up the game if a tile is placed incorrectly and then a bunch of other tiles are then placed off that wrong tile. 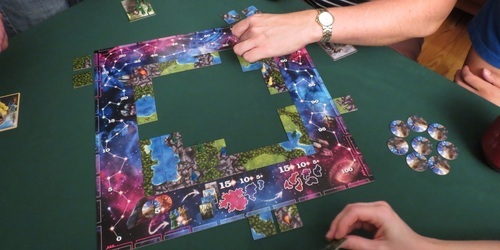 The board can get really crowded, and I’ll admit that it can get hard to see things when there are multiple hands reaching over the board – trying to place a tile on the far edge of the world, flipping tiles across the board, etc. Also, make sure that none of the gamers are wearing droopy sleeves or this can cause a severe earthquake! Like most real time games, I find 4 Gods to be fragile. Everyone has to understand the rules, and unless you’re spending all your time watching what other players are doing (and therefore spending NO time looking at what you’re doing yourself), you never have a great feeling for what is happening. As I alluded to earlier, incorrectly placed tiles can be problematic. There are also awkward moments when two players want the same tile/city/god at the same time – and there isn’t really a good resolution system for this. We’ve chosen to rock-paper-scissors for any ties, but this also takes those players out of the game while they resolve the tie. Real time usually means avoid for me, but quick real time is at least a blessing. The frenetic feel to the games is triggered as soon as real time is mentioned and Dale is right – you all have to know the rules to make the game work. even so, this means that people will make tile laying errors in their first game, but having played a few games now, these are quickly spotted. Once the initial frenzy is over there is time (really!) to assess the situation. As you seek a particular tile combination to destroy a city or play to link two areas, you do need to be focused to carry out this task. I like the fact that you can review other people’s tiles – that is unusual in a game and adds more opportunities to make a better move. As you can gather I am a fan, but I have played with some people who hate the pressure and will never, ever, ever, play again. So this game is a marmite game – love it or hate it in my experience so far.